Excellent cruising 55 Chevy. Beautiful older tutone repaint in a very dark purple lower that looks black until bright light hits it with a bright white upper. Still looks great with a few chips from use. Clean body with nice trim and chrome. All glass is great and windows work as they should. Mild custom pinstriping that could be easily removed. Engine is an incredible 383 stroker sbc putting out over 450hp. Built by Kurt Pedracci at Hot Rod Machine at a cost of $10k approx. 3,500 miles ago. Holley 750 double pumper carburetor. MSD ignition. 7 quart oil pan. Mini hi-torque starter. Doug Nash headers into Flowmaster mufflers. Walker radiator. Muncie 4 speed with a Hurst shifter. Centerforce clutch. Runs and sounds awesome. Very strong engine. Front suspension has been rebuilt and 2″ lowering spindles have been installed. 605 steering box with power steering has been installed. Rear has new leaf springs with 1″ lowering blocks. Rear end has the original housing with new 3:55 posi gear set and old school traction bars. Non-power front disc brakes with rear drums. One of the best riding 55’s I’ve had in years. This car is ready to show or cruise. A bunch of money has been spent on this car over the last 8 years getting it to where it is today. The only rust I can find is a small hole on the back side of the left rocker(see pics). Clean California title and the car is currently registered. 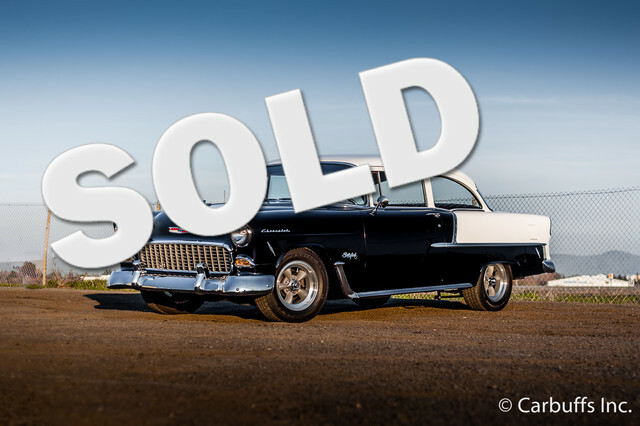 Only being sold to fulfill another couple wants from the bucket list which are a 1933 – 1934 Ford 3 window or 2dr sedan – chopped or a 1961-1962 Corvette.